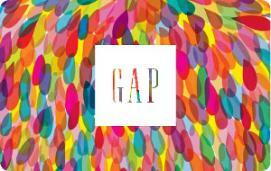 Earn 5 SB per $ when you buy Gap gift cards at MyGiftCardsPlus. Gap has everything you need to express your personal style. Whether you're looking for wardrobe essentials such as t-shirts, hoodies, great-fitting pants, or denim, you'll find great clothes and accessories for men, women, boys, girls and baby at Gap.